For over a century, the sight of a legendary steam locomotive barreling across the countryside at top speed, blasting a column of thick smoke into the horizon was something to behold. Now you can ride through the history of steam trains, from the classic days of the 1920s to the twilight of the 1970s, in this fast-paced collection. For an action-filled, full color experience, this lavish production takes you on the ride of a lifetime aboard some of America's legendary steamers. TRAINMASTER (Hendersonville NC) on 2011-07-19 15:48:27. Actually only half the program is steam, but GREAT variety, some footage (short lines) that I have never seen before. Age of some of the footage is why I only rated it as good, most is excellent, considering the source material. The extras are diesel oriented, but again the variety and the historic nature of the footage (fallen flags), will be of interest to the non-steam enthusiast. I suspect the variety will keep kids watching. Well worth the money. Benjamin G. Hartog, Ph.D (Seattle, WA) on 2013-05-19 09:32:21. Unmitigated junk. Unmitigated trash. Unmitigated worthlessness. Texas Hi-Railer (West Texas) on 2012-01-19 00:10:33. 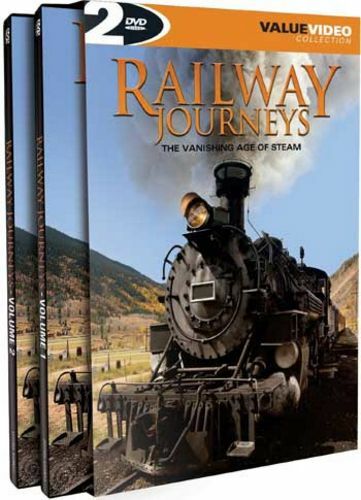 This is a great DVD collection with plenty of footage of some real nice older steam locomotives. It has both steam & diesel locomotives for your viewing pleasure. I saw some models I hadn't seen before so that was a nice surprise. It shows plenty of "Fallen Flags" and is a real good history of railroading in America from the steam era to the age of the great diesels. The quality is very good in my opinion and I would say this is definitely a "Must Have" for the serious railfan or collector. You won't be sorry you added this one to your railfan collection!